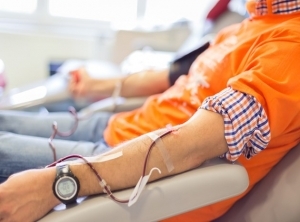 Australians have been urged to give blood between Easter and Anzac Day to prevent a shortage, and help cancer patients and road accident victims. Australians have been urged to donate blood this Easter to help cancer patients and road accident victims. More than 4000 donors are needed between Easter Saturday and April 26 in order to prevent a shortage of blood products, according to the Australian Red Cross Blood Service. "The need for blood doesn't take a holiday so we're urging Australians to factor a blood donation into their plans this Easter," spokeswoman Helen Walsh said. People with O and A blood types are needed to help boost stocks and platelet donations are also desperately needed. Platelets are the clotting agent of blood, are vital to cancer treatments and also help to combat bleeding from road trauma and other emergencies. "Unfortunately platelets have a shelf-life of just five days which means we can't stockpile them and with three public holidays in quick succession this Easter, we need people donating during this time period to meet demand," Ms Walsh said. In Australia, one in three people will need blood in their lifetime but only one in 30 currently donate, according to the Australian Red Cross. Blood donation centres are open throughout the Easter period except for Good Friday. The Australian Red Cross launches Xmas "Blood Blitz"